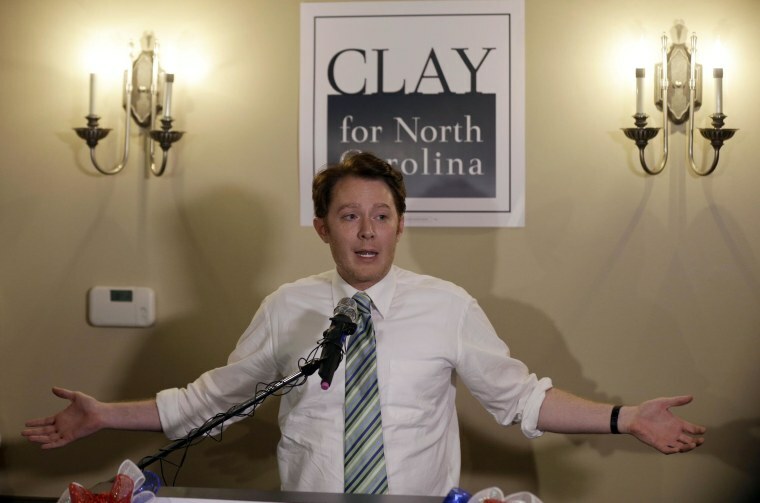 Clay Aiken edged out his now-deceased opponent Keith Crisco to become the apparent winner in the Democratic primary for a North Carolina congressional seat, according to a vote count released by the state’s Board of Elections on Tuesday. The former "American Idol" contestant led the late Keith Crisco by just 390 votes, but received more than 40 percent of the vote necessary to win the three-candidate race held on May 6. North Carolina's State Board of Elections will certify results on May 22. Crisco died suddenly on Monday from injuries he sustained after a fall in his home. He was 71. Aiken will now face incumbent Republican Rep. Renne Ellmers in the race to represent the state's GOP-leaning 2nd Congressional District, which Mitt Romney easily won in 2012.